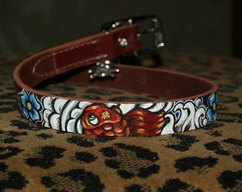 up to 14 inch ( small) 3/4 inch wide Black LEATHER Handpainted Leather Dog collar from the Tattooed Pooch! 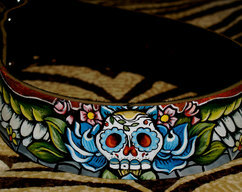 This cool and unique handcrafted and handpainted durable tattoo styled collar has a love banner with sparrow, heart, dice with flames,rose etc....... there is also a nikel plated silver toned Skull and cross bones charm hanging from the loop! 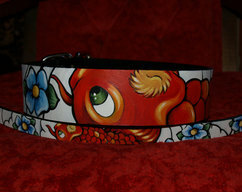 Painted by the artist Anna Graham of Anagram Fine Art and the NEW Tattooed Pooch! 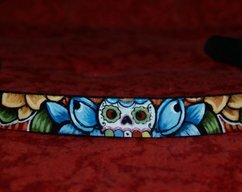 ***also check out other auctions for tattoo and classic styled purses, handbags , collars,dog bowls,pottery and lots of cool vintage stuff! usa usps shipping is free!